Tanzania is one of the better places for walking safaris in Africa. It is though important to distinguish between 'hiking up hills' as in climbing Kilimanjaro or even Mt Meru or Hanang and the very different experience of a wilderness walking safari. We have in our ranks, some of Tanzania's best walking safari guides. 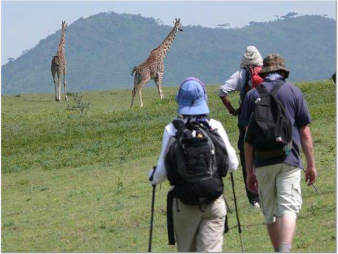 Serengeti Walking Safaris Short 3-4 day walking safaris have recently been introduced within the Serengeti National Park itself and can relatively easily be incorporated into a longer northern Tanzania safari. A favoured alternative of ours is a longer 7 to 10 combined walking, game driving, camping safari - based out of either private wilderness mobile camping or even more flexible light mobile camping - on the wilder peripheries of the National Park, either in the Maasai community areas of Loliondo or through the valleys and dramatic gorges of the Gol Mountains. The Ngorongoro Highlands offer a fabulous range of walking opportunities, far removed from the Crater itself. Often supported by Masai & their donkeys, these are more cultural, wilderness walks than a heavy game option but there are many varied routes around the hills / ridges and forests of Lemagrut, Olmoti and Empakaai where the flower, birdlife and forest animals are abundant. These walks can extend onto the southern Serengeti plains, following drainage lines and dry river beds towards Olduvai and Ndutu (at their best between December and May) or alternatively a stunning route from Empakaai Crater down to Lake Natron, including the summit of the last remaining active volcano in the area (Oldonyo Lengai) for the fit and the brave. There are many other options in northern Tanzania ranging from Arusha National Park (even the lower slopes of Mount Meru make for a wonderful 2-3 day walking safari, the open plains and old ranches of West Kilimanjaro (where its also possible to combine walks with horseriding and game driving safaris), the wild country of Longido and Natron as well as the southern areas of Tarangire National Park, including the community areas eastwards towards the Maasai Steppe. One of the most popular ways to experience a few of these areas in one safari, along with some camping and game driving off the beaten track is by way of light mobile camping - with kit and back up pared down to the minimum this is about as flexible, and real an experience as it gets with the added advantage of being great value. In Western Tanzania, we operate some of our wildest walking safaris within Katavi where we offer anything from 2 to 3 days walking between remote flycamps as part of a longer stay at Chada Katavi to week long expeditions. An ideal combination with these is a few days at Greystoke Mahale where the walking opportunities within the forests of the Mahale Mountains (whether in pursuit of chimps or simply exploring the wider area) offer a wonderful contrast to any game experience elsewhere in the country. The best time of year for walks in the North - the southern & eastern edges of the Serengeti and the Ngorongoro Conservation Area are best between December and May, whilst the central and northern Serengeti and Tarangire area are better from July through to October. Almost by definition walking safaris of this sort are not about distance, they're about slipping below the surface of the wild, and doing your best to observe wild animals without being observed yourself. Some of the best 'walks' we have done have covered little more than a mile in a couple of hours but have generated an intensity of experience that will stay in people's memories for years to come.